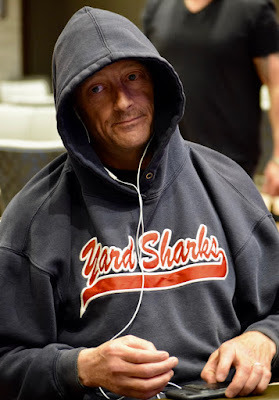 George Saca opens, Lance Oliver moves in for 46,000, Joe McKeehen 4-bets to 100,000 and Saca - with about 550,000 chips and 100k behind McKeehen's stack - folds Pocket_Sevens face up. McKeehen shows Ace_King and is well ahead of the King_Eight of Oliver (above). There's a 7 in the window, two Queens follow, and a King on the river, McKeehen eliminating Oliver. Oliver is out in 31st place, a $7,522 cash as action moves to 90-minute levels.